Housing Solutions of Southeastern Massachusetts – formerly known as South Shore Housing – is a regional nonprofit organization focused on providing housing services and developing affordable housing in Plymouth and Bristol counties in Massachusetts. We help low- and moderate-income families and individuals secure affordable housing and use that housing as a foundation for improving their economic stability and wellbeing. Our service area encompasses all of Plymouth and Bristol counties, as well as Randolph, Weymouth, Holbrook, and Cohasset in Norfolk County, with a total population of slightly more than 1 million people living in rural and suburban towns as well as the gateway industrial cities of Fall River, New Bedford, Brockton, and Taunton. Housing Solutions — then known as South Shore Housing — was founded in 1970 as a board-run operation with no staff and limited financial resources. Since then, the organization and our impact have grown dramatically. Housing Solutions now has 50 employees in five program areas and a budget of over $20 million (25% of this supports operations, and 75% represents the value of our rental subsidies). During its first five years, the agency purchased and rehabbed five houses, which were then rented to low-income families. 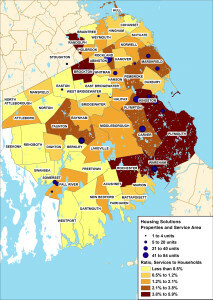 In 1974, the State Department of Community Affairs (now the Department of Housing and Community Development) contracted with us to implement and administer the State’s rental assistance program in Plymouth and Bristol counties. We now administer approximately 2,200 rental subsidies in the region, and we have developed nearly 500 units of affordable housing, including 390 rental housing units that we still own and operate. In subsequent years, the State tapped our agency to run a wide range of regional housing service programs including the Housing Consumer Education Center, Residential Assistance for Families in Transition (RAFT), and HomeBASE. All of our programs, initiatives, and accomplishments are founded in the belief that stable, affordable housing enables families and individuals to improve their lives and future prospects.